Construction loans: What's involved and How do they work? Home / Articles / So you have the land, now how do you pay for the house? So you have the land, now how do you pay for the house? So you’ve managed to buy a nice block of land at a fair price – Congratulations! Now comes the exciting part – building your dream home! We’re going to skip over the fun part where you where you look at display homes, decide on a plan (or come up with your own), find a builder, plan the landscaping, get the site surveyed and soil tested, research tap wear and tiles, weigh up the pros and cons of an indoor herb garden, consider heating and cooling options, check out window treatments, select carpets and flooring and decide where to put the water tank so its not the first thing you see as to pull into the driveway. Here, we’re just going to explain how construction finance works. It may not be as exciting as picking colour schemes and we’re yet to meet anyone who has a Pinterest board they’ve named “Finance Inspo,” but without nailing the finance structure, your dream home may remain just that – a dream. The easiest way to explain how construction finance works is with an example. Let’s just say you purchased a Mr Fluffy block in Canberra recently for $600,000. You secured an 80% loan of $480,000 to purchase the land and used your cash reserves to fund the shortfall and purchasing costs. You’ve now reached the stage where you’ve agreed on a Fixed Price Contract* with a builder and a construction price of $400,000. 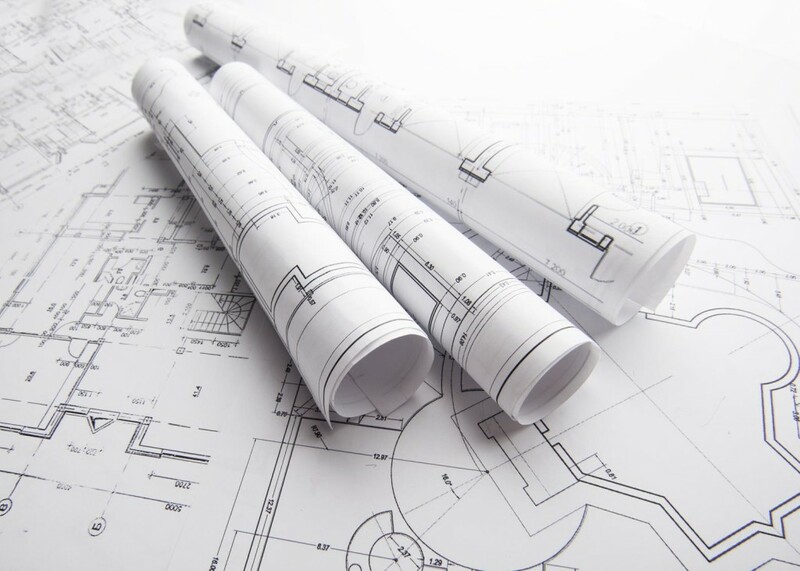 It’s time to get the construction finance process underway. It’s likely a pre-approval loan for your construction loan was submitted at the same time as your land loan application. If so, now it’s just a matter of providing some updated documents, as well as your Fixed Price Building Contract to the lender. As part of the assessment process, the lender will arrange a valuation to determine the estimated end value of your property once your new home is built upon your existing land. With a land value of $600,000 and a build price of $400,000, it would be nice to think that the estimated market value of your completed property would be $1 million (at least!). This is not always the case though. Remember that a valuation is based on comparable sales. Which means that if there are no comparable sales for new homes in your area, the comparable sales analysis may consider older homes of a similar size and result in a valuation figure less than what you were hoping for. For ease of illustration purposes, we’re going to assume the valuation comes in at $1 million. We’re going to keep to an overall LVR of 80% (to avoid LMI) and remember you already have a $480,000 loan secured against the block of land. 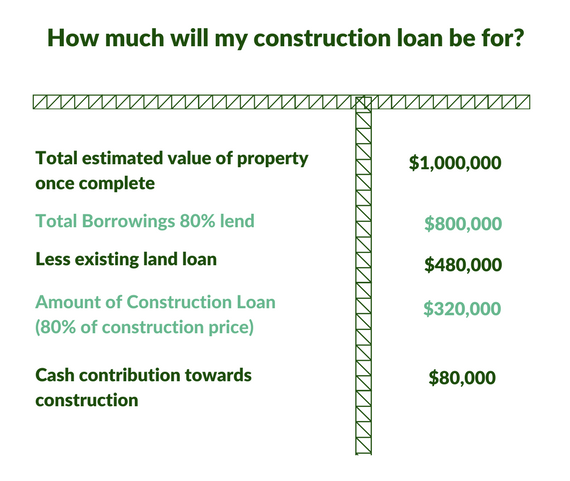 How is a construction loan drawn down? A construction loan works differently to a normal home loan because the lender does not release all the funds at once. The funds are released to the builder as ‘progress payments,’ at various pre-determined stages of the build. There are a number of documents a lender will require before allowing progress payments to be released. These include – but are not limited to the signed building contract, council approved plans and builders risk/ public indemnity insurances. When do I make my cash contribution towards the construction? Before the lender will pay any invoices and release payments to the builder, you need to pay your cash contribution first. In this example scenario it’s $80,000, meaning the first few invoices will be paid from your cash reserves. For example, you would first pay the deposit amount of $10,000. Then, you would pay $60,000 for the floor slab (once the works are completed and the invoice has been issued). You’ve still got $10,000 of your total $80,000 contribution to pay. So once you receive the frame invoice, you would pay $10,000 from your cash and the lender will pay the remainder of the invoice. 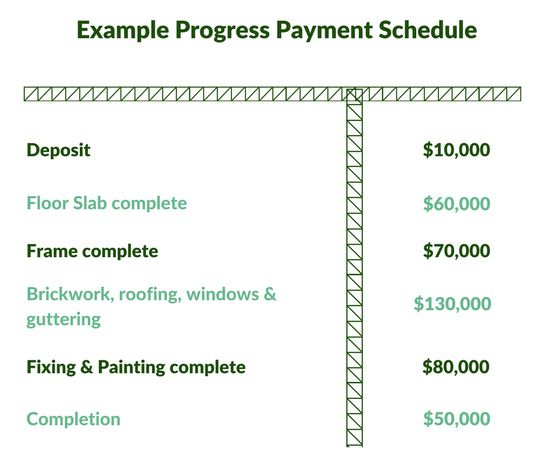 From this point onwards, any invoice received from the builder will be forwarded to your lender and paid as “progress payment” from your construction loan. How do the progress payments get released? Once you have paid your entire cash contribution, any further invoices you receive will be provided to the lender for payment. We can help with this part to ensure everything runs as smoothly as it should. Generally with the first and last progress payment request, the lender will insist an inspection of the works be completed before they release any payment to the builder. This is to confirm work has been completed as per the building contract. When do I start paying interest on my construction loan? You start paying interest on your construction loan as soon as the first progress payment is made. Remember, you’re only making repayments on the portion of the loan that has been drawn down. Plus, during the construction phase, you only make interest only repayments. It’s not until the loan is fully drawn down – i.e the build is completed and all the funds have been released – that you start making monthly repayments on a fully drawn loan balance of $320,000. If you have any questions or you’re keen to understand how the construction finance may work for a knock-down rebuild situation (hint: it’s similiar! ), give us a call.